Atlantis Hotel Complex is located just a very short distance away from the beach of Laganas, which is the most popular tourist resort in Zakynthos (Zante) island. Combining a very privileged location with a wonderful view and a great surrounding landscape, Atlantis Hotel is the ideal place to enjoy relaxed, pleasant vacations. Staying at Atlantis you may find a perfect balance between having fun and relaxing, having a large number of options to choose from, whatever type of enjoyment you may prefer. Atlantis Hotel will surely satisfy guests of every age! We will make sure that your stay with us is as pleasant and special as possible! Book your accommodation directly from our website to access the most amazing deals and discounts! Choose your desired check-in and check-out dates to check availability and reserve your room at Atlantis easily and quickly! Being at just the right spot, Atlantis Hotel offers an ideal combination of relaxation and the lively cosmopolitan life of the center of Laganas resort. Laganas is the most cosmopolitan resort in Zakynthos (Zante) island, a dreamland of choices for those who like the best in nightlife experiences. The wide and long (9 km) sandy beach is one of the largest in Greece. It has clear, shallow waters, ideal for children. Laganas beach is one of the reproduction sites for the Caretta-Caretta sea turtle and the area is under the supervision and protection of the Greek National Marine Park. One may watch the turtles in their natural environment, hiring one of the small boats that tour the gulf. 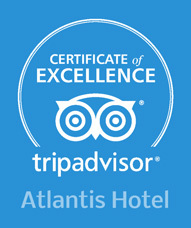 Follow Atlantis Hotel for news, amazing discounts, new photos and videos!